Do you have a unique piece of jewelry in mind but can’t seem to find it anywhere in the Fayetteville area? Not to worry because at Hinkamp Jewelers, we are happy to assist you through the process of designing a completely new, one-of-a-kind piece. Our custom jewelry design experts will work with you to ensure the beauty, practicality and durability of the design and help you create the jewelry of your dreams. Since 1955, our jewelry experts have been making jewelry ideas a reality for customers in Fayetteville, NC and beyond. No idea is too big for us to tackle and we will do everything we can to make sure your piece turns out the way you envisioned it. Custom designing a piece of jewelry can mean a lot of different things. 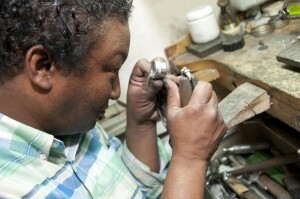 That is why our Fayetteville jewelry experts are trained in all aspects of customization. We also offer customers the chance to restyle an existing piece of jewelry. If an item in your jewelry box has gone out of style or you simply want something new, bring it to Hinkamp Jewelers. We’ll work with your specifications to create something fresh and exciting. Reach out to our jewelry store with any questions you may have regarding our Fayetteville custom design jewelry services. We look forward to meeting you!engraving, which can add a personalized touch to any jewelry piece. This service is performed by machine to ensure accuracy and optimum precision. In addition to Fayetteville, Hinkamp Jewelers is proud to serve customers in Fort Bragg, Clinton, Elizabethtown, Southern Pines, Dunn, and beyond.